During the last week, there have been many conversations circulating through different media and social networks about our Prime Minister Jacinda Ardern wearing a kākahu (cloak) at the recent Commonwealth Heads of Government Meeting. Kaitiaki Māori Collection Manager Mark Sykes explains the differences between kahu huruhuru, kahu kiwi, kahu kuri, and korowai. Last Friday international media such as the Guardian reported that Jacinda Ardern, at the Commonwealth Heads of Government Meeting, was wearing a kahu huruhuru, a kākahu adorned with feathers. They also explained for their readership the significance of the kākahu. Closer to home, however, the reports and photographs that were published of the Prime Minister reported that she was wearing a ‘korowai’ loaned to from Ngāti Rānana, a well-known roopu of Māori living in Britain, who support many of our government officials when they are in the Commonwealth. In te ao Māori the word kākahu can describe the type of clothing one might wear, and also a word that is used when talking of Māori cloaks as a general term. This word, in parts, forms the classification of our different styles and types of kākahu. The kākahu our PM wore as describe earlier was a kahu huruhuru, describing a kākahu that is adorned on with feathers of manu (birds). 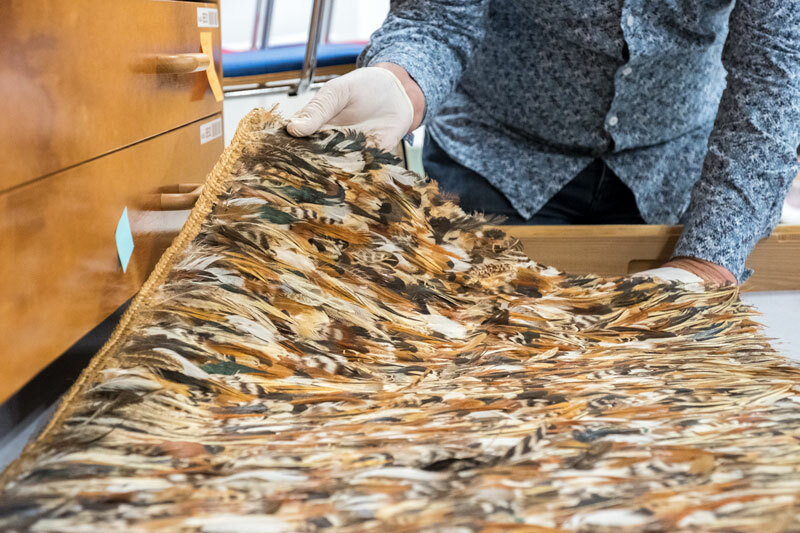 In Te Papa’s collections there many exquisite examples of kahu huruhuru, showing the feathers of the kērerē, kākā, tūī, and many other manu. Today, kahu huruhuru are more likely to be adorned with pukeko, pheasants, or other types of manu, due to these being more readily available. 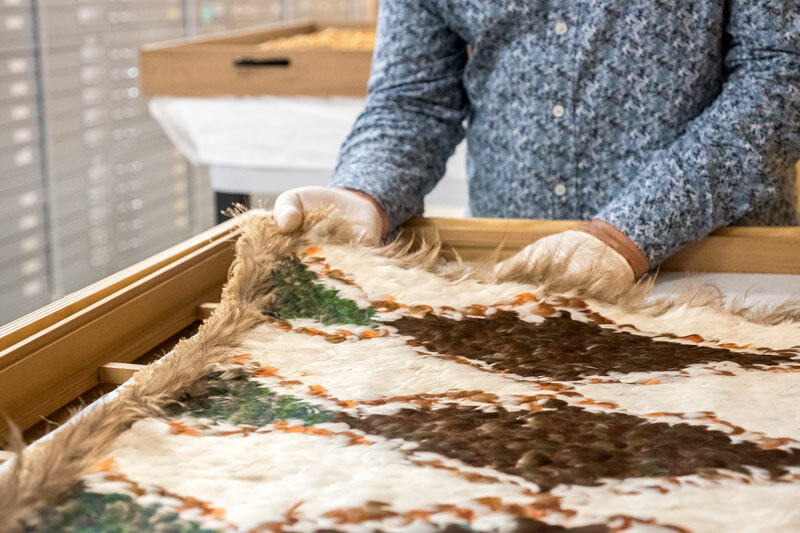 The kahu kiwi, one of the more prestige cloaks, are adorned with the feathers of the kiwi, and are held in high esteem and were worn on special occasions. Kahu kuri (dog-skin cloaks) were the most prestigious Maori cloaks before the kuri (Pacific dog) became extinct in the early 1800s. 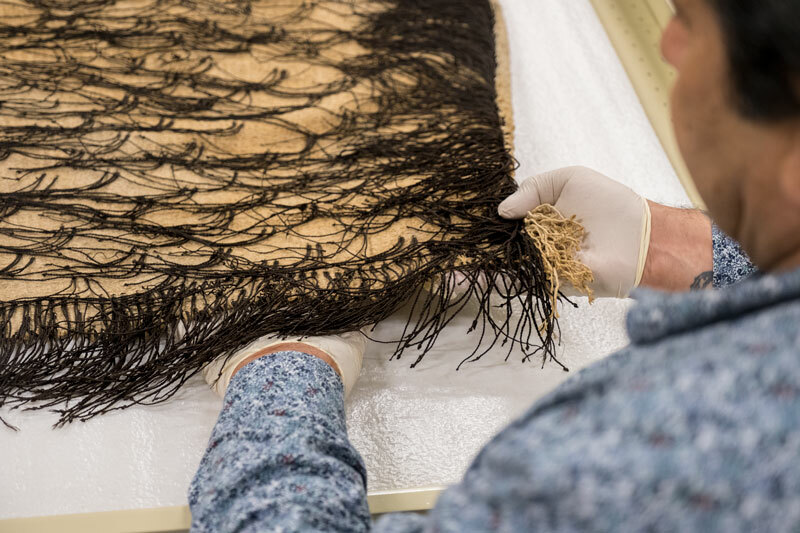 The hide and hair were used also used to decorate the awe of the taiaha, a fighting weapon used by our tupuna. This type of kākahu is a very distinctive style, with the body of the kākahu and the neck border adorned with hukahuka, best describe as decorative tags. The hukahuka are made from rolled muka (flax fibre) and usually dyed black. As you can see there are many different styles of cloaks, each being very different and distinctive, each style having their own name to distinguish one from another. So how has korowai become the word most used to describe a kākahu? Let’s go back to the article that appear in the Guardian last Friday. Te Papa was contacted by the Guardian to seek clarity around the type of cloak the PM was wearing and what the significance was of her wearing it. In a quick four-minute phone call, I spoke to the reporter about the type of cloak which I describe as kahu huruhuru, kākahu with feathers, and then the significance of our PM wearing the kākahu. Good on the Guardian for making contact with Te Papa in the first instance to make sure that their information they published was the correct. The media forum is a powerful tool. Reporting the correct name, in this case of the PM’s kākahu, means the information would reach people in Aotearoa and internationally, helping them to understand not only our Māori taonga and the correct use of words to describe our kākahu, but also their significance for Māori. 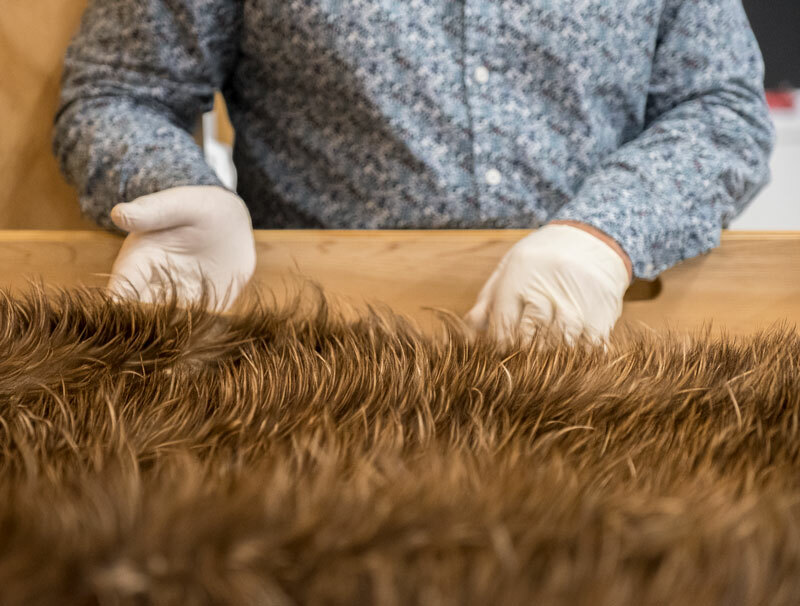 Working here at Te Papa, and being very privileged to be one of four kaitiaki (guardians) that look after the Māori taonga collections, we are often asked on many occasion ‘what is that kākahu?’ or ‘what is that taonga?’, and we then have the opportunity to tell the stories of the cloaks, as they don’t have a voice themselves. Again I ask ‘when is a korowai not a korowai’? tira. She regards this as a great honour and it is be kept in the family and passed on . Could you please give her the correct wording and meaning to be put in the inscription . Thank you sincerely yours ANNE . Sorry Mark not used to this .first part got erased ,dont know why. My daughter was awarded a beautiful Maori Cloak by her staff members as a mark of esteem for her.They wove it themselves and they regard her as a Rangatira. Please put this in front of above comment .Kind Regards Anne . What’s your thoughts about people calling a korowai not a korowai, meaning: when the feathers are sewing on by the sewing machine and what maori name would this cloak be given… kaakahu?..korero Mai..
Kia ora Mark. Such an interesting insight and thank you so much for the explanation. Also just a quick hello and to let you know our little St. Joseph’s School Matata will be visiting Te Papa on Wednesday 23rd May, about 10.00am. Maybe we will see you there. Kia ora Freda, thank you for your response, and great to hear from you, and will be intouch re visit. My friend many years ago recieved once a year kiwi feathers. She was commissioned to make kahu huruhuru. At $14,000 each. These I believe are for royalty and people like the prime minister. Should the PM have one permanent rather than borrowing one. I think our top people should have their own in parliament to VIP guests. She told me it takes years to gather and complete a kiwi feathered kahu huruhuru. That only 5 people receive the feathers. I haven’t seen Judy Te Hiwi for quite some time but her workmanship is highly impressive. Great kōrero, it’s be even better if kākahu was spelt correctly with a macron please. Thanku Mark, I have always reffered to cloaks as kahu??? Kakahu as general term Kakahu being modern term, kahu the older term?? Confusion??? It is what happens when kupu are standardised. Other thing for us to remember is kupu used maybe different with each whanau, hapu iwi. Kia ora Hemo Ata, ae like yourself I have always used these kupu, and it is important that at every opportunity we enlighten people about the importance of using the correct kupu. Another korero or paper could be written around this whole take. A great project for someone…. Thank you for this wonderful and valuable information and images. Great to see you too. Much Aroha Fiona. Kia ora Fiona, Good to know you found the blog ok, and good to hear from you. Contact me through my Te Papa email be good to korero re your kete. Kia ora Penny, thanks for your reply hope it was informative for you. A interesting question, to my knowledge, kakahu means, clothing, garment, dress and also cloak. The word kahu can also mean the same. 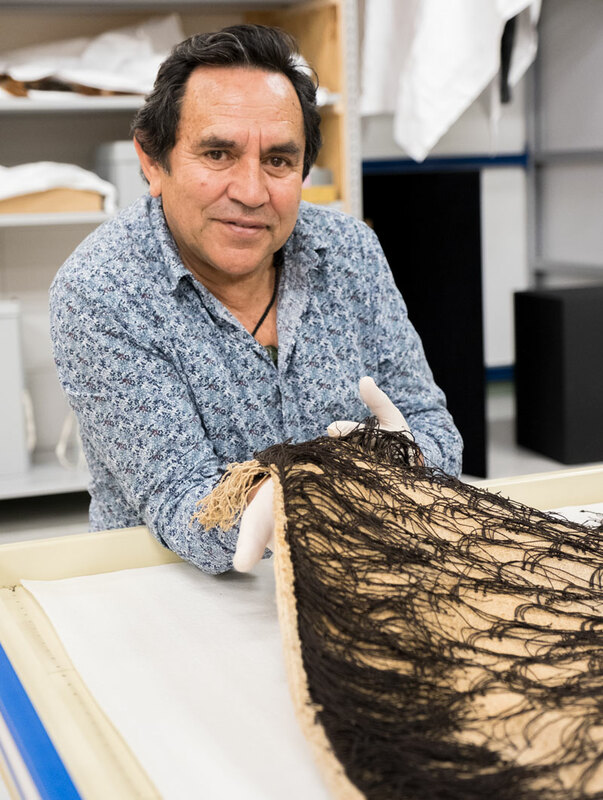 For classification as in the blog, kahu huruhuru describes a feather cloak and in many publications referencing kakahu this wording is used. So the words maybe interchangeable depending in what context they are used. Look forward to others whakaaro on this. Kia ora Mark — thank you for that interesting blog. My question is about the words kahu and kakahu — are they interchangeable, or do they have special meanings? Thank you. Ka nui te mihi mo tenei korero Mark. Rawe!